I’ll never forget the day that I walked into the kitchen to find Lily (about six at the time) sitting on the table and waving her “magic wand” at her little sister while saying, “Bippity-boppity-boo, make this room clean!” Grace (about two) ran around putting things away as fast as she could so she could help the wand to work! That day I had an epiphany: kids will like cleaning more if they think it’s a game. Sometimes we do have to just hurry up and clean, but whenever I remember to have a little fun, chores are usually accomplished with much better attitudes! If you give chores fun names, sometimes it can make young kids think the job itself is fun! 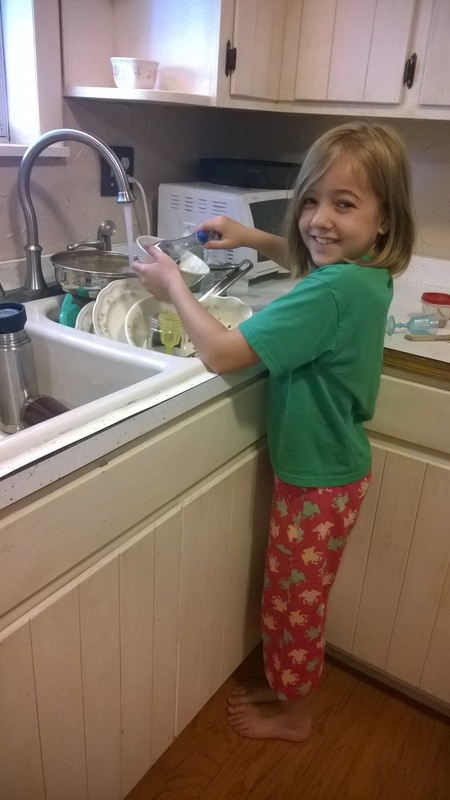 For example, I never ask Grace to “gather dishes.” She’s a nature lover so I ask her to go on a “dishes hunt.” She really thinks that getting to hunt for dishes is cool (please don’t tell her otherwise!). Yesterday we even made two dolls come to life. I became the baby-sitting doll and she was the child. We talked in our best doll voices and cleaned our “doll house” (the schoolroom). She loved this change of pace! For older kids, chores can be made cool with cold, hard cash. Lily will cook dinner for the entire family for $2.00. Even with the cost of food factored in, that’s still way cheaper (and healthier) than eating out somewhere. Plus, cooking and working to earn money are valuable life skills for kids to learn. I also keep a sheet on the fridge with chore ideas and amounts that I’m willing to pay for each chore. Both girls are welcome to do those chores anytime. On days I need to work extra on the computer or the house just really needs some TLC, I’ll declare it a “double-your-money-chore-day” and every single chore is worth double. Older kids also understand reasoning really well. For example, sometimes I’ll tell my kids that whoever helps really well in the kitchen, living room, and bathroom gets to relax while everyone else cleans the bedrooms. This motivates Lily to help really well because she knows she’ll be able to relax while I finish up! Race. Sometimes I’ll assign races. For example, Lily will clear the table while I load the dishwasher or she’ll make the beds while I put dirty clothes in the hamper. The winner of each race race gets a tally mark. When we’re done cleaning, whoever has the most points wins. The “loser” then makes the winner a simple snack or a fun drink or rubs the winners shoulders for a minute. This motivates both of us to clean fast! And of course, I always emphasize that when the house is clean, we’re all winners! Occasionally have a reward (a glass of soda, stickers, a book you bought used, etc.) for anyone who was a really great helper. Only give a reward to those who actually were good helpers. Don’t overwhelm. 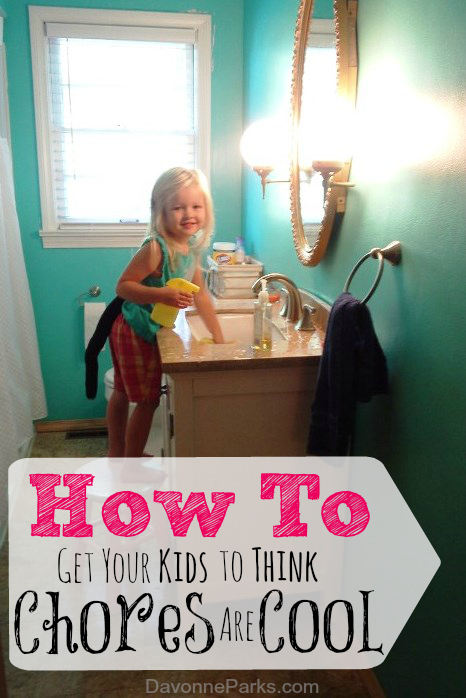 If the house is an absolute wreck, possibly clean one room by yourself before enlisting help from the little ones. Have a kid’s cleaning bucket! Play a game or read a book afterwards. Make sure to let your kids know that since they saved you so much time by helping, you now have enough time to do a fun activity with them! How do you make chores a little more fun in your house?